For the past 4 years, I have been deep in the AdWords/Facebook Ads world. This experience on the advertiser side of the aisle changes the way I experience ads as a Facebook and Google user. Specifically, looking at Facebook ads in my newsfeed is like watching sausages get made – I can immediately identify the secret ingredients that advertisers use to lure me into clicking on their ads. Facebook Ads are complex, and every advertiser has their own unique targeting strategy. I spent the last few weeks trying to reverse engineer the ads in my newsfeed and compare them to my ad preferences. I made a bunch of assumptions when analyzing these ads, but below are my targeting guesstimates and initial reactions upon seeing them. Targeting: Plated showed me this ad at 4pm on a Thursday, probably the day I should start thinking about weekend dinner plans. 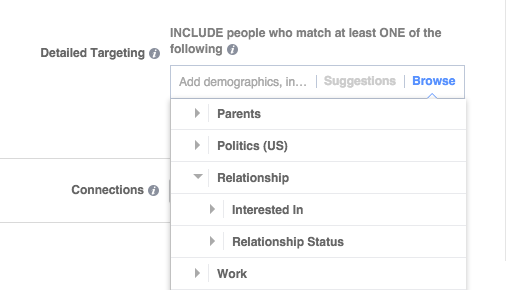 They used (demographic-based) relationship status layered with day-parting as their targeting strategy. They also hit the key buzzword for anyone making a purchase decision— Free ? Strategy: Launch does a great job of using numbers/statistics to increase their credibility and give their audience FOMO. They also put the date of the festival in the title so if you don’t click on the ad, you still learn when the festival is. This is an easy way to capitalize on impressions. Similar to Plated, they offer a discount to their FB audience and make it a focal point in them middle of the ad. They used interest targeting or similar audience targeting. The approach of using numbers to increase social credibility has been a strategy for a while. Does anyone else remember when websites had hit counters on the bottom of them? 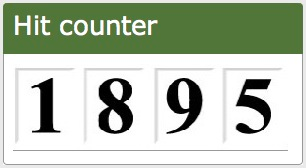 These counters were a way to tell new users that there have been X number of people that have been to the site before you (the original FOMO). Strategy: Small Business Funding uses the description text to qualify leads before you click. They tell you upfront who their customer is so that only qualified customers click on the ad. This is an outside the box way to try and increase conversion rates and decrease the cost per conversion. Strategy: Not 100% sure the strategy here since I already pay for and use Optimum internet. 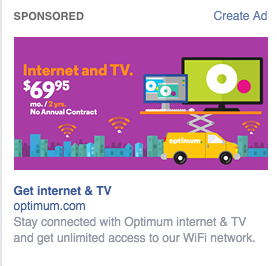 In fact I was using my Optimum internet when I got this advertisement. My guess is that they are targeting people in their geographical markets without much attribution connected to it. Strategy: Ninjacat sent me this ad at 8pm on a Friday night. They used day-parting and interest targeting to serve me this ad. They also put a question front and center in their creative. This is meant to be probing and drive a strong point. 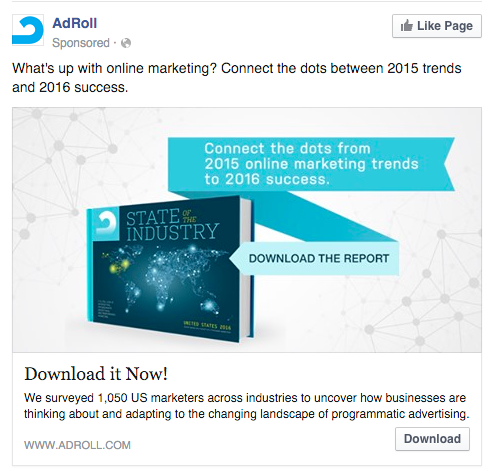 Strategy: AdRoll gives away a free piece of content in exchange for your name, email, and more details about your business (just as we do with our AdWords glossary?). This is a great way to increase your qualified leads and increase CTR. You want to give the user as much value as possible and make it free in exchange for more information. They could have targeted me many different ways, however, I was on their site last week so I am going to guess they were using remarketing. Remarketing is a great strategy to implement, especially if you have a complicated sales cycle. Generally, you want to remarket to people that have visited your site, but have yet to convert/buy a product or service. But be careful, sometimes remarketing can go too far and freak out your customers. 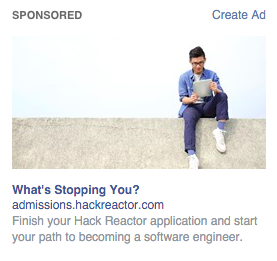 Strategy: Hack Reactor used a sophisticated type of remarketing to show me this ad. Their ad text tells me that they have analytics on every part of their conversion funnel and they know that I started an application, but did not finish it. I can assume that the ad text changes in their ad based on the part of the funnel you get to. If I went through the whole application and then did not hit submit, I would guess that their ad text would say something more like “Did your forget to submit?”. Always customize your ad text when remarketing to specific parts of your sales funnel. Remarketing and ad text go hand in hand? 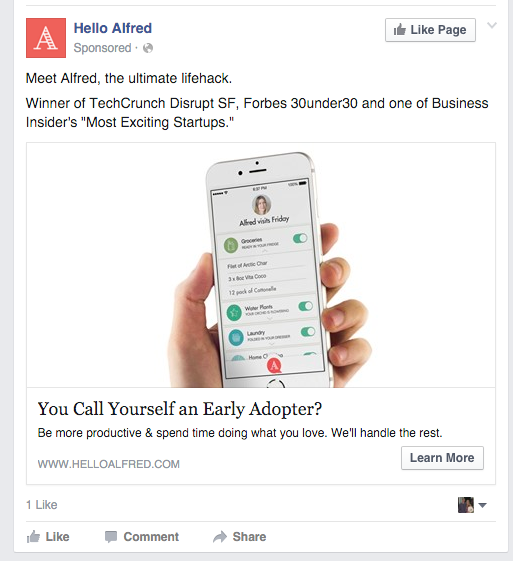 Strategy: Alfred utilizes interest targeting to ask you a rhetorical question in the headline of their ad. They are using the early adopter (behavior- based) category and then asking users if they are an early adopter. This is an easy way to relate to people and connect on a personal level. 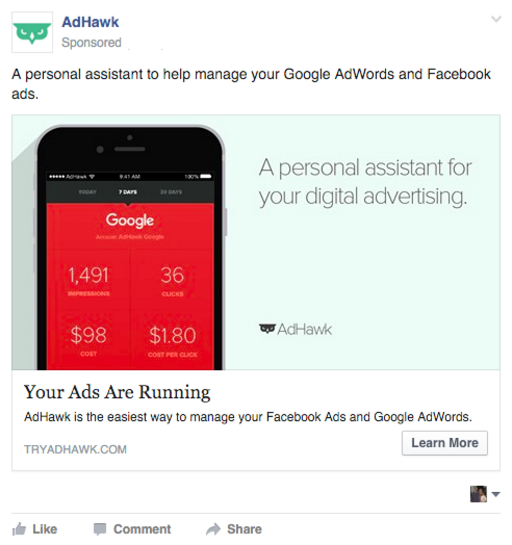 Strategy: AdHawk explains it’s value prop right away by telling you what they offer and how they offer it. This ad targets users similar to the ones that have already signed up. If you haven’t tried it yet, Facebook’s similar audience tool works great when you upload email addresses of your most engaged customers. Facebook ads can be extremely powerful if you use them the right way. You need to test different targeting methods, ad texts and calls to action. Here are some videos to help you get started. If you are a small business owner and just starting out with Facebook ads, consider this 3 Step Strategy from Fit Small Business to build lasting relationships with your customers. If you have any other questions feel free to reach out to me todd@tryadhawk.com. I love hearing about different techniques, strategies and success stories. Todd is the co-founder and CEO of AdHawk. Prior to starting AdHawk, he was a founding member of the Accelerated Growth team at Google, a division of the AdWords team dedicated to helping startups rapidly scale their business. When he’s not experimenting with new campaign strategies, you can find him hustling to find the next diamond in the rough for his fantasy baseball team.